•	APT FOR ROTTWEILER PUPPIES- Royal Canin Rottweiler Junior Puppy Food is apt for Rottweiler puppies from 2 to 15 months. 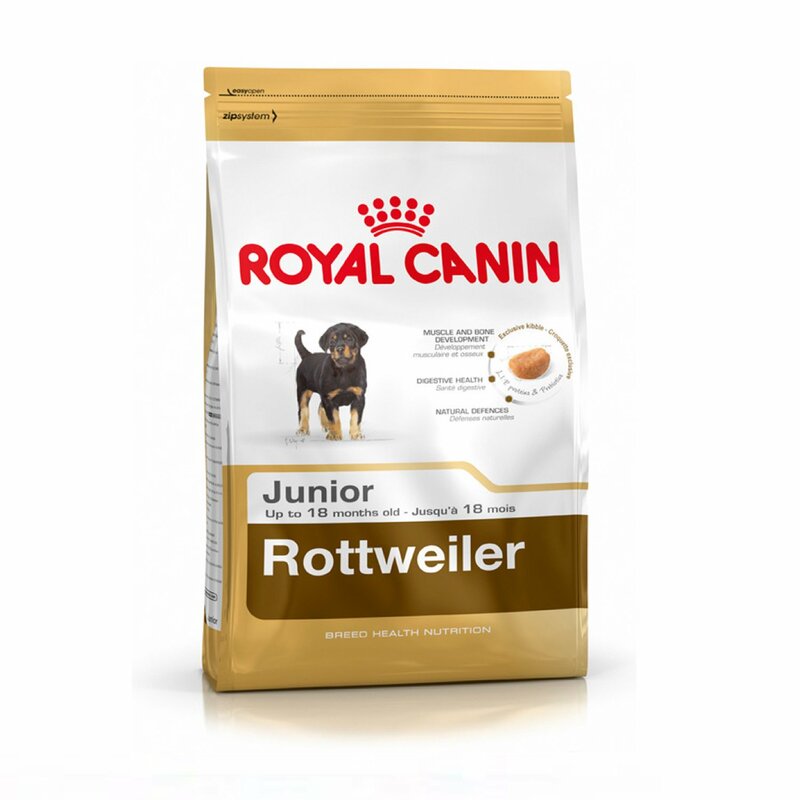 •	ENHANCES B1 STRUCTURE- Royal Canin Rottweiler Junior Puppy Food is high in nutritional value that helps in enhancing B1 Structure improving bone strength to promote the healthy development of Puppies. 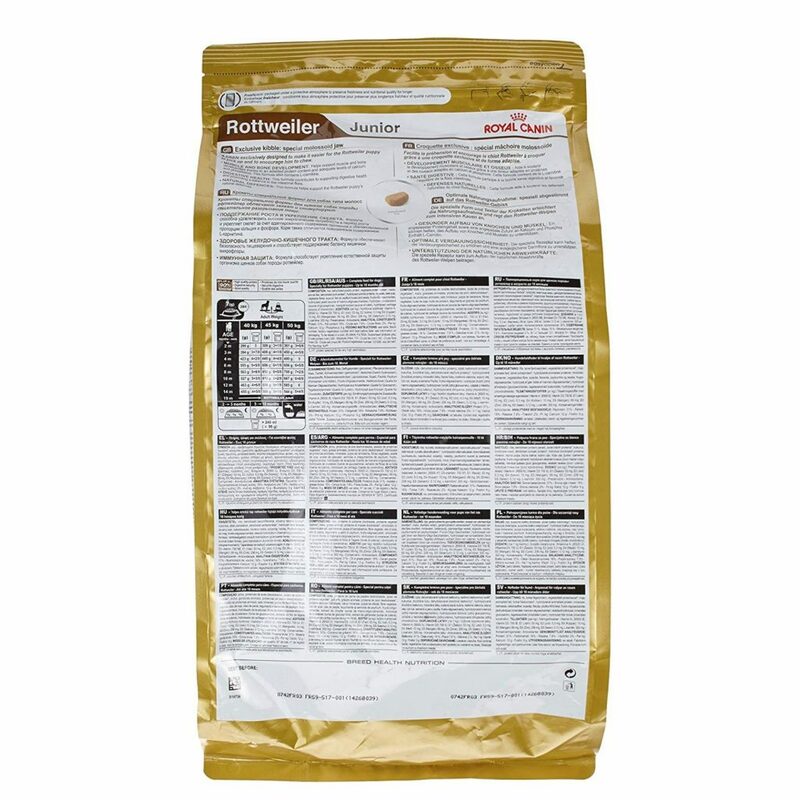 •	MAINTAINS IDEAL WEIGHT- Royal Canin Rottweiler Junior Puppy Food contains an apt amount of protein, calcium, and phosphorous that promotes harmonious weight gain and also maintains an ideal weight to these puppies. •	IMPROVES DIGESTIVE HEALTH- This formula improves the digestive health of growing puppies and also promotes a balance in the intestinal flora. •	EXCLUSIVE KIBBLE DIET- Royal Canin Rottweiler Junior Puppy Food is an exclusive kibble diet designed especially for weaning puppies. Royal Canin Rottweiler Junior Puppy Food is designed especially for Rottweiler puppies of 2 to 15 months, who are at a growing stage. This food is an assortment of various essential nutrients that help in improving the B1 Structure of growing pups that promotes bone strength and healthy development. Royal Canin Rottweiler Junior Puppy Food contains an apt amount of protein, calcium and phosphorous that promotes harmonious weight gain and helps in maintaining an ideal weight of growing puppies. The food is a proven Kibble Technology that reduces the formation of tartar on teeth and promotes Dental Health. This food is a complete diet for the weaning puppies, who are learning to grow.